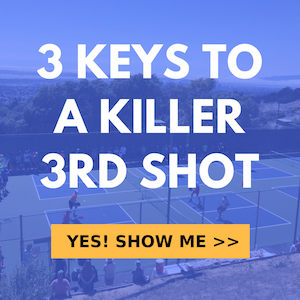 One of the best possible options available to you with your return of serve is to hit a slice. The slice is not only limited to the backhand side but you can use it on your forehand return too. The reason why it’s such an effective options as a return is that you can get the ball very deep and still keep it low which make it very difficult for the serving team to get into net from your return. Forcing them to stay back by making a 3rd shot drop incredibly difficult is a great way to raise your chances of winning that point. The first team to capture the net has the best chance of winning the point especially if the other team has at least one person that is forced to stay back. Slicing the ball is one of the best ways to achieve this. In this video we will show you how to drill a strong, consistent, deep and low slice return and groundstroke.